Can wearable tech make public speaking less scary? Public speaking gives some people the jitters. A new intelligent user interface for Google Glass gives real-time feedback on volume modulation and speaking rate, all while remaining minimally distracting. The new interface can record a speaker and transmit the audio to a server to automatically analyze the volume and speaking rate, and then present data to the speaker in real-time. The feedback lets the speaker adjust his or her volume and speaking rate or continue as before. Researchers will present a paper on the system—which they call Rhema after the Greek word for “utterance”—today at the Association for Computer Machinery’s Intelligent User Interfaces (IUI) conference in Atlanta. “My wife always tells me that I end up speaking too softly,” says Ehsan Hoque, assistant professor of computer science at University of Rochester, who has used the system while giving lectures. “Rhema reminded me to keep my volume up. It was a good experience.” He says the practice has helped him become more aware of his volume, even when he is not wearing the smart glasses. Providing feedback in real-time during a speech presents some challenges, the researchers say. “One challenge is to keep the speakers informed about their speaking performance without distracting them from their speech,” they write. Overcoming these challenges was the focus of the research, says M. Iftekhar Tanveer, the paper’s lead author. 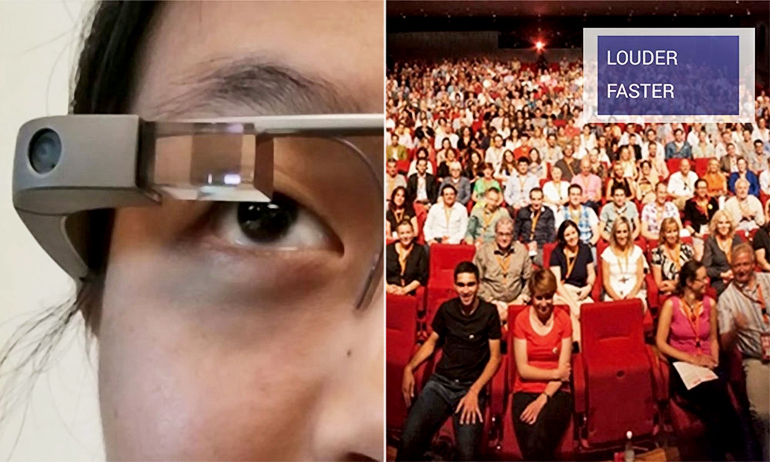 To do this, they tested the system with a group of 30 native English speakers using Google Glass. They evaluated different options of delivering the feedback and then experimented with using different colors (like a traffic light system), words, and graphs, and no feedback at all as a control. They also tried having a continuous slowly changing display and a sparse feedback system, by which the speaker sees nothing on the glasses for most of the time and then just sees feedback for a few seconds. After user-testing, delivering feedback in every 20 seconds in the form of words (“louder,” “slower,” nothing if speaker is doing a good job, etc.) was deemed the most successful by most of the test users. Overall, users said the technology helped improve their delivery compared to the users who received continuous feedback and no feedback at all. “We wanted to check if the speaker looking at the feedback appearing on the glasses would be distracting to the audience,” Hoque says. However, there was no statistically significant difference among the three groups on eye contact, use of filler words, being distracted, and appearing stiff, as judged by Mechanical Turk workers. As part of their future work, the researchers want to test their system with members of Toastmasters International as a more knowledgeable audience. The researchers also believe that live feedback displayed in a private and non-intrusive manner could also be useful for people with social difficulties (e.g., Asperger syndrome), and even for people working in customer service. Rhema is free to download from the team’s website.